O God, you have created all nations and you are their salvation. 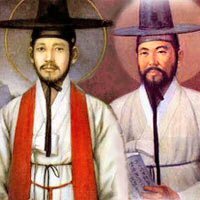 In the land of Korea your call to Catholic faith formed a people of adoption, whose growth you nurtured by the blood of Andrew, Paul, and their companions. Through their martyrdom and their intercession grant us strength that we too may remain faithful to your commandments even until death. We ask this through our Lord Jesus Christ, your Son, who lives and reigns with you and the Holy Spirit, one God, for ever and ever. Amen.